Strike action is continuing across the federal public service as staff campaign for fair pay and conditions against the Abbott government's harsh attack on wages, jobs and rights. Most recently, public servants at the Murray-Darling Basin Authority have voted to strike, joining their colleagues at copyright agency IP Australia who voted in the first week of July to take industrial action. As the left in Australia faces the need to organise against escalating racism from mainstream politicians and the far right, important lessons can be learned from anti-racist struggles across the world. Sibylle Kaczorek is a Socialist Alliance activist now living in Melbourne who was active in anti-racist campaigns in Germany. She spoke to Green Left Weekly's Nick Fredman. Despite Germany officially becoming an anti-fascist state after World War II, there have been continuing connections between the far right and the state haven’t there? Can you help the 'little paper with a big heart'? Green Left Weekly supporters around the country have begun an important six-week campaign to boost circulation of the paper. We’re asking supporters to help us out by taking a small bundle of papers to sell to friends and workmates. In Sydney, several supporters are now doing this: they are finding great interest — sometimes from unexpected quarters. These were some of the labels people wrote across their mouths at the silent protest in Perth against the chilling effects of the new Border Force Act. An important protest for marriage equality will be held outside the Labor Party's national conference in Melbourne on July 25. The protest is being organised by Equal Love Melbourne. It is one of a series of demonstrations being organised in the lead-up to the spring session of parliament, where it is expected that several bills for marriage equality will be debated. Marriage equality has recently been won in Ireland and the United States. This places unprecedented pressure on the government. Australia is becoming more and more isolated globally. A planned show of strength by racists and neo-Nazis in Melbourne backfired when once again far-right protesters were outnumbered 20 to one on July 18. Over the weekend of July 24 to 26, the nation will be watching as the Australian Labor Party (ALP) holds its 47th triennial national conference at the Melbourne Convention Centre. The Labor Party’s national conference is its highest decision-making body, deciding its policies and future direction. The Labor party’s previous national conference was in Sydney in 2011. At that conference, it voted for a policy supporting marriage equality. Despite that vote, and the Labor Party being in government until the end of 2013, marriage equality was not made law. "The age of entitlement is over". I'm sure it seemed like a good slogan when it was cooked up, at least to the party room hacks and spin doctors in Tony Abbott’s government. Of course it was only going to be a matter of time before they tripped over their own words: “The age of entitlement is over”. Come to a Women in Black silent vigil for peace. Mourning the victims of violence around the world. Saturday July 25 at 10.30am. Old Courthouse in the Mall. Watch a film: Selma. Follows the civil rights movement in the 1960s, with a focus on Martin Luther King Jr. Entry $10/$5 conc. Friday Jul 24 at 6pm. Brisbane Activist Centre, 74b Wickham St, Fortitude Valley. Ph Dom 0431 638 772. Protest outside the ALP conference on Saturday July 25. Rally for clean energy at 11am. Organised by Getup! Doctors, nurses and their supporters protested on July 11 and 12 around Australia against the Border Force Act. 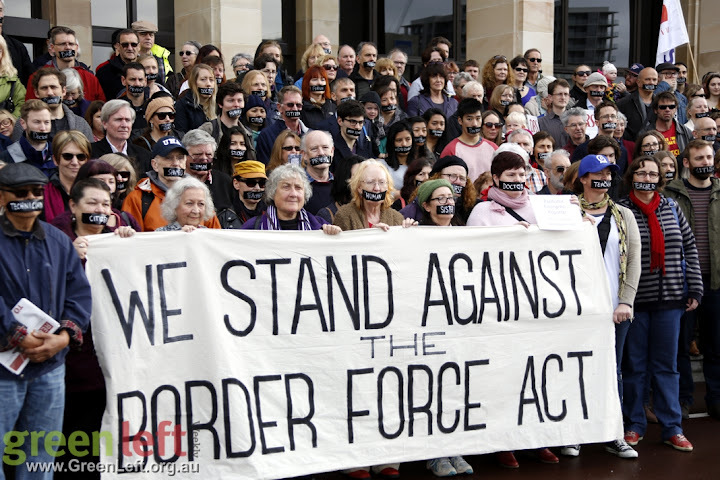 The protests, organised by the Medical Association for the Prevention of War and Doctors Against the Border Force Act, were held in Darwin, Broome, Coffs Harbour, Adelaide, Bendigo, Melbourne and Sydney. Earlier in the week an open letter from 40 current detention centre workers said they would defy the Border Force Act was published.